Liposomes are microscopic spheres that are excellent carriers of active ingredients for efficient absorption. In the past, liposome technology was used by hospitals to carry medicine that was delivered intravenously. Vitasome® has perfected liposome technology to maximize potency, bioavailability and nutritional value in variety of nutritional supplements. Why do Vitasome®’s supplements absorb at a higher rate than other vitamins? According to the Physician’s Desk Reference, regular vitamins can lose up to 90% of their potency on average. This happens for a number of reasons. One reason is that they are often accompanied by additives that trigger an immune reaction (rejection) by white blood cells, which prevent unwelcome additives from absorbing through the small intestine. Another reason is that the active nutrients are too big to pass through the small intestine, and only a small percentage can survive the digestive process that makes nutrients small enough to be absorbed into the blood stream. 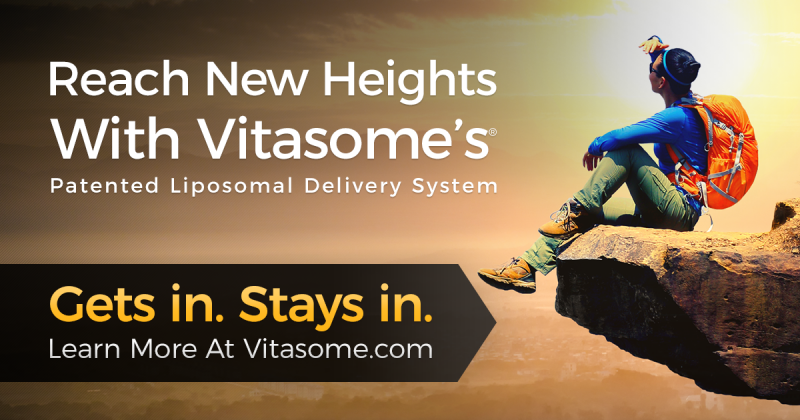 Vitasome® has solved the problem of nutritional waste with its groundbreaking liposome delivery matrix. Vitasome® takes care to source only the purest, all natural, non-GMO ingredients and, when available, we choose organic over conventionally grown ingredients. While it is not always possible to find certified organic raw ingredients, we are careful to ensure the ingredients we use are grown by cultivators who apply their own organic practices, with or without the official certification. I heard that Glutasome® can help brighten my skin. Is this true? Yes, skin brightening is a positive side effect of taking glutathione, and naturally occurs when you have higher doses of it within your system for longer periods of time. If skin brightening is your desired outcome, we recommend taking at least two servings of Glutasome® per day. I’m on a lot of different medications can I take these products? Since we are not aware of the medications your taking, we recommended that you consult your physician or pharmacist about the active ingredients in our supplements to be sure there are no adverse interactions with the drugs you are taking. You should feel the vitamins working within you from the very first week. We suggest taking at least 2 sachets for the first 7 days. What is the best time to take your products? Vitasome® products give you a surge of energy, so the best time to take them is first thing in the morning. If you are on a regiment of multiple daily-doses, take the second in the early afternoon. Should I take it on an empty stomach. For maximum absorption, it is beneficial to take liposome products on an empty stomach. If your stomach is ordinarily sensitive to vitamins, it may be better to take them with a meal. What’s the best way to mix the liposome powder? It’s ideal to add a sachet of powder to a dry glass or sports bottle, then add room temperature water (or juice) and stir or shake, then refrigerate or add ice if you prefer a cold drink. If you want to add it to a bottle of water or juice, you can add the powder mix directly into the bottle and shake it well so the liposomes are evenly disbursed. Can I mix both Glutasome and Curcumin-C in one drink? Yes, you can. Vitasome® recommends using at least 8 ounces (250ml) per serving packet (16oz for two), then stir or shake it to blend ingredients. Since our products are naturally flavored with real fruit, combining them together tastes great! Are there any side effects of your products? Yes, you can notice a slight energy surge or tingling sensation. This is harmless. If your stomach is sensitive and if taking vitamins or medications on an empty stomach ordinarily causes discomfort in your GI tract, we recommend taking Vitasome® products at meal-time and not on an empty stomach. We always recommend consulting with your regular healthcare provider before starting any new dietary supplement program. What do you mean by a “stealth” layer? Vitasome surrounds liposomes with a protective layer of lipids (fats) that are identical to the membranes surrounding cells in our body, which allows the nutrients to evade detection by the white blood cells, which are notorious for rejecting additives in some foods and vitamins. Yes, our bioavailable product line is completely vegan. Yes, the bioavailable product line uses NON-GMO ingredients. I am allergic to shellfish and nuts. Can I take your supplements? Yes, our products are free of allergens. Should I take Curcumin-C™ before or after my work out? It is best to take Curcumin-C™ post – workout to boost your energy and strength. And, it’s most effective on an empty stomach at least 30 minutes prior to eating a meal. Can I add your liposomes to my smoothies? Yes, the flavors go well in smoothies. Are your liposome products Diabetic-safe? We use Stevia instead of sugar as a natural sweetener, which is widely used as a sweetener around the world and considered safe for diabetics. Will your supplements be good for my teenager who is an athlete? Absolutely, but we recommend that you first check with your family physician before starting any new supplementation routine.